Are They Really the Solution to the Crisis in Public Education? 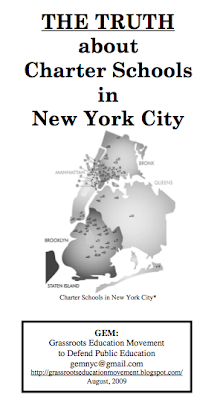 Charter schools continue to expand into the Harlem community and communities throughout NYC and the entire country. They purport to stand for more parent choice and power and for an opportunity for quality education for students who have been historically denied that opportunity. But what is the reality? • Do Charter Schools actually represent a genuine movement to establish parent choice and equitable education for ALL students? • Do charter schools provide adequate channels for the democratic input of staff and parents? • At this forum [last Sept. 2nd], we [invited] parents, students teachers and community members to consider the role that charter schools play in the larger national agenda to privatize education in the United States. • Charter schools are opening while public schools are closing or being placed in smaller spaces that hinder their growth. Charter schools also have stricter admission policies. With all these “at-risk” or “failing schools” closing, where are their students going to go? Who will accept them? Click brochure cover above for a downloadable pdf. Our post about the forum that took place in the State Office Building in Harlem, last Sept. 2nd got inundated with spam comments, so we’re reposting the above paragraphs. It was sponsored by the Office of Senator Bill Perkins, the Grassroots Education Movement (GEM), the Coalition for Public Education (CPE), the Center for Immigrant Families (CIF), Black New Yorkers for Educational Excellence (BNYEE), and parents and teachers from NYC schools, including P.S. 123, 30, 197, 241, and 368.